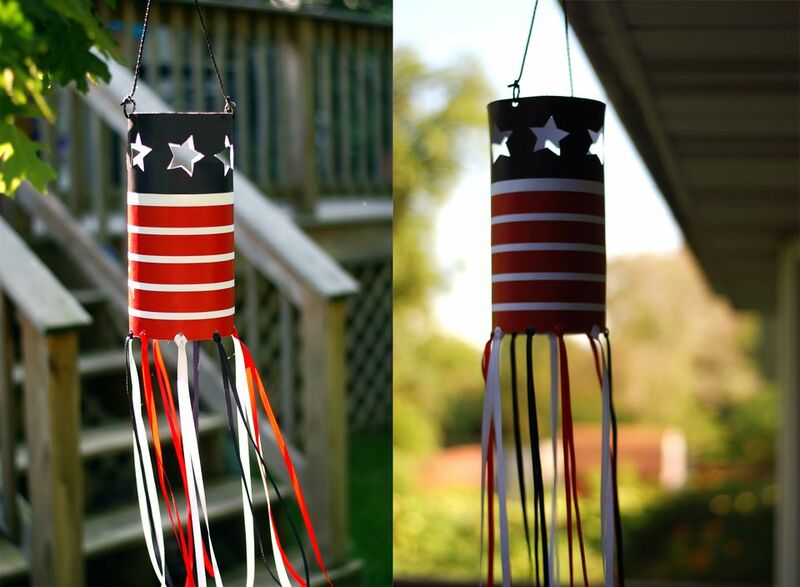 Make some pretty 4th of July hanging lanterns for your celebration. These lights go well with the 4th of July luminary table decorations. They are easy and quick to make using the free printable available for download and an oatmeal box! Who would have believed it was so cheap to produce. So make some 4th of July lanterns and add some ambiance to your holiday gathering. You will be glad you did when you receive all the compliments from your guests! Download and print the hanging lantern printable. If your printer is unable to print on 11 x 17 sized card stock, go to the nearest quick printer and have them print it for you. The cost is usually minimal. Trim the top, right side and bottom margins with a ruler and craft knife. Do not trim the left margin. There should be an approximately 1/2-inch area of white space. Cut out the stars using a Xacto knife and ruler. The center of the luminary is a recycled oatmeal box. The cereal box fits the patriotic printable perfectly and makes the luminary sturdy enough to hold large candles. Trim the oatmeal box with an X-Acto knife so that it is 6 and 1/2 inches tall. Apply tacky glue to the entire outside area of the cut oatmeal box. Wrap the cut luminary template around the oatmeal box and apply gentle pressure with your hand to help the template adhere to the oatmeal box. *Important* Leave a 1/2-inch paper overhang on the bottom portion of the glued template. Punch holes evenly along the bottom edge. Attach the ribbon streams as in the photo above. Make sure to apply a knot to the top hole. The inside of your luminary should now look like the above photo. These lanterns are able to hold heavier candles without a problem. If you are concerned about fire safety make sure to use a battery operated candle. Cut three lengths of red ribbon.. Each ribbon strip should be 30 inches long. Cut three lengths of blue ribbon.. Each ribbon strip should be 30 inches long. Cut three lengths of white ribbon.. Each ribbon strip should be 30 inches long. Punch 9 holes on the bottom of the lantern 1 1/2 inches apart from each other. Loop ribbons through each hole, following the order of red, white and blue. Cut a .5" x 16 3/8" paper square from leftover card stock. Punch two holes in the top of the lantern and attach cord to make a handle. You may use regular or battery-operated candles in the lantern. Always remember to use common sense when burning a candle. Never leave a lit candle unattended! You Will Never Believe that This Beautiful Necklace is Made From Paper! Decorate Your Gifts with Cute Paper Flowers!